When we are working with Website Account Registration / Account Login Page, We have to present a Signup form based on our website requirement. In case we are provide a simple signup form with Email, password, Confirm password. In this case we can use External website Login from OAuth Providers among most familiar services among web. Such this think , Google, Yahoo, Facebook, Twitter all major services are provide OAuth to accept web developer/Website owners are use their credential to accept users on their websites. Let us create a Login Page for our website to accept the visitors those who already have a account with Google or yahoo. Website registration and Login forms have important aspect of our development process. Currently visitors were not interested to fill large forms in any website. In this case visitors are not willing to join by signup on our website. In this aspect, technology will a solution. that is open social login from other major services. By this way, we can be use Login from google, yahoo, facebook, twitter. First, Let us create a open login for our website login or registration form with Google Account and Yahoo Mail. upcoming days we will see other services. Now we can create website Login with OpenID OAuth Login with Google Accounts and Yahoo Accounts. Google and Yahoo provides Federated Login for Account Users with OAuth. Embedded HTML Code for an Image is an advanced technique for Modern Web. Standard HTML Images are map with <IMG> tag using src attribute src attribute is to be an URL of an Image. Following PHP Function we can build the HTML Code for an Image. Simple captcha with PHP, We seen how to create a Simple captcha . Now we look how to integrate that simple Captcha with HTML Form. 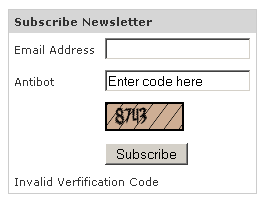 Now I am going to show you a Newsletter Subscriber with our Simple Captcha.